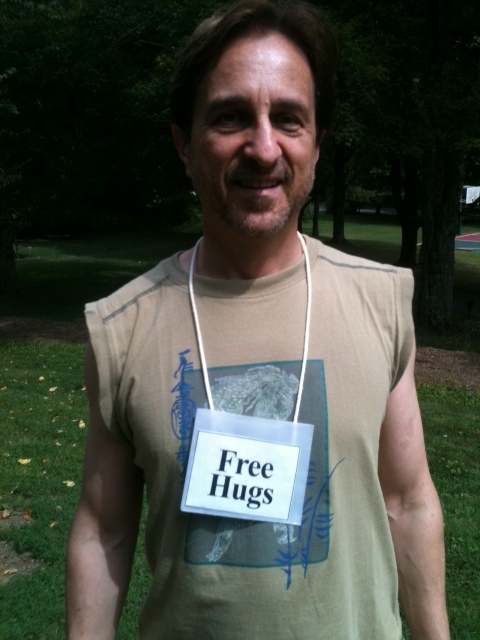 Free hugs at Omega Institute in Rhinebeck, NY. Our connections with fellow humans — either fleeting or lasting for many decades — are the sine qua non of happiness (ie, without relationships with others, there is no happiness, and that’s about it for my 8th grade Latin). Simultaneously, these connections can be vexing, painful, or unpleasantly surprising. However, because we do in fact need each other, it makes sense to heed the Dalai Lama’s advice when it comes to our interactions with others. This is the advice I have in mind, from one of the Dalai Lama’s books I read years ago: in every interaction we have, we can make the other person happier, or less happy. That is powerful. Every single time we make a human connection, we can either add to or decrease the other person’s happiness. Not that we are responsible for others’ happiness entirely. But it is quite a moral responsibility when put in those terms. And, it may also be highly practical, because, well, you never know. Let me tell you a little story, one of my favorites. I’m quite pleased to find a happiness hook that gives me an excuse to share it. The story takes place way back in 1968, when I was 14 years-old. I was third of six kids, and we didn’t have a lot of money. So the fact that I was by myself in our living room, listening to the Beatles’ Sargent Pepper’s Lonely Hearts Club Band album was unusual. I loved that album, which I bought with hard-earned babysitting money. Loved, loved. I was happily singing along with all my blissed-out teenage heart when a friend of my oldest sister walked through the room. Let’s call him Paul. Paul was handsome, witty, charismatic. I had a bit of an unrequited crush on him. When Paul paused at the front door and turned to speak to me, I was all a flutter, thrilled that he was stooping to talk to me! “Do you know my definition of stupid?” he asked. “People who sing along to the Beatles,” he responded before turning around and exiting my house. All these years later, I can’t quite remember how little and unworthy that remark made me feel. Instead, this story has become a family joke. You see, just three years later, I married Paul’s younger brother Bob. 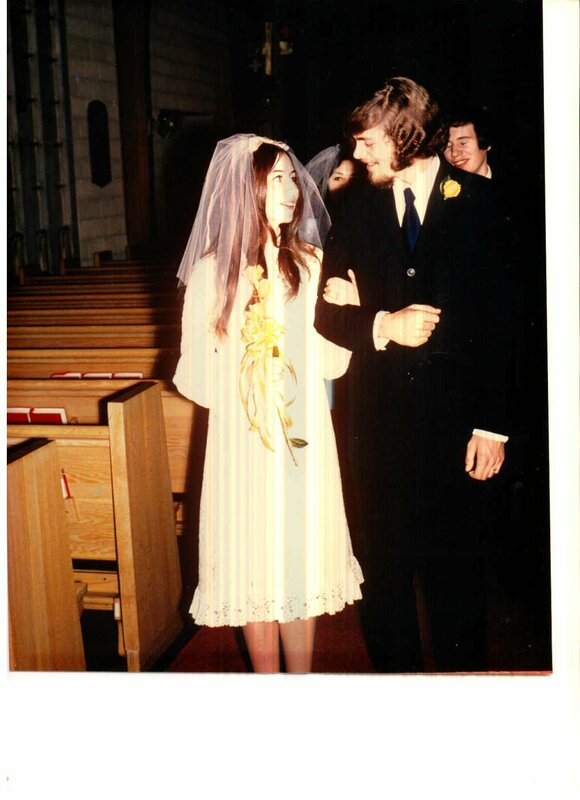 When Paul made that offhand remark to me, he could never possibly have imagined that I would be his sister-in-law for, oh, just about 45 years so far — and that I would never let him forget that brief interaction! Not that I blame the funny, self-assured 18 year-old that he was then. It was a long, long time ago, and that moment in time has been superseded by many another loving and supportive word or act (like driving Bob and me to the hospital to have our first baby, and doing Ed Sullivan imitations along the way). No, the reason I love this story is, it clearly shows, when we connect with people, making them happier or less happy, we have no idea what roles we might play in each other’s lives in the future. So being nice is both good common sense, and good karma sense. Consider the case posted on Twitter last month about an angry man who cursed at another commuter on London’s Tube. Not only did the angry man add to someone else’s unhappiness in the moment — he added to his own. He arrived at a job interview a little while later and discovered that the man he had just cussed at was the interviewer. He did not get the job. That’s a very graphic — and karmic — illustration of how interactions can affect our own happiness as well. As Donovan so beautifully warbled many years ago, happiness runs in a circular motion. It’s also interesting to think about what might have happened if the angry man in the Tube had somehow connected with the interviewer in a more positive way during their commutes. Perhaps he would have gotten the job? Perhaps they would have had an ongoing, positive relationship? Certainly, connections do not need to be lengthy to be significant. Two summers ago, I was wearing one of my favorite dresses (very happy, covered in blue daisies) as I walked toward the library. A woman I had never seen before, or since, was walking in the opposite direction. As she neared me, she said, “You look very nice today, ma’am.” That’s all. But she made me smile, and feel good. I beamed a very genuine, “Thank you!” in her direction. Certainly I’ve been on the proactive side of the equation many times. Recently, while vacationing with our cute-as-a-button two year old grandchild, we sang to and for total strangers in an open-hearted way that is hard to imagine without an innocent babe involved. We were received in the same open-hearted way, again no doubt thanks to our granddaughter’s presence. Otherwise, we grown ups aren’t normally this sweet to folks we don’t know. Even without cute babies, strangers can give that to each other. Tal Ben-Shahar tells a story of an early, early morning at an airport, a morning at the start of a long flight, a morning when he was not at his happiest — until a woman who worked at the airport bestowed a warm and kind smile on him. That brief but genuine connection cheered him up so much, he continues to tell the story year after year as part of his lecture on making the choice to smile more often. I love it. Done judiciously, it’s such an easy win-win. Of course, our most meaningful connections are found in relationships of longer duration — but every relationship has to start somewhere. Some connections we’re born into. Most, we have to establish. 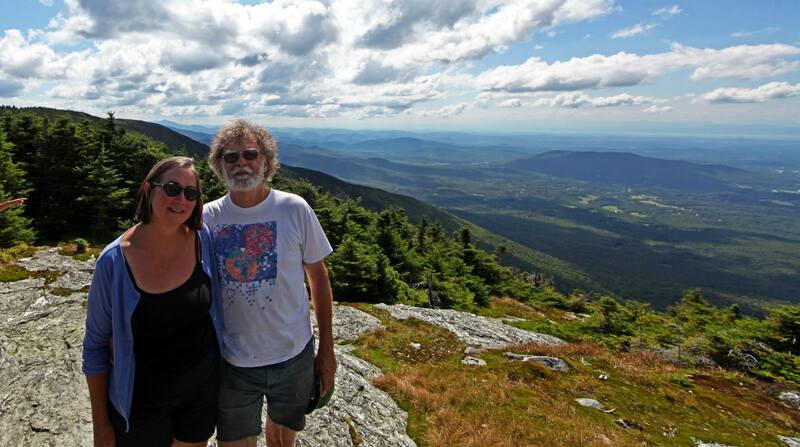 I remember the beginning of my friendships with two of my dearest friends in Vermont, Judy and Eric. We had lived here only a few weeks, and I felt lost among the many happy strangers at the Maple Corner Fourth of July bash — until this kind and interesting couple took the time to chat with me, the newcomer, the stranger. None of us knew that a deep and abiding friendship was being born. I was just grateful that these two were being nice to me, seeing, hearing, and valuing me. Connection. It’s all about the nice, within limits. The point is to add to the world’s supply of happiness — yours included. As a recent meme on Facebook put it, “you are not required to provide heat to others by setting yourself on fire.” Sometimes the best we can do is not infect others with our glumness. There is also the question of authenticity. Who are you? What is the best way for you to make connections — deeper connections with loved ones, new and even one-time connections with strangers? Who may or may not end up married to someone in your family. Or giving you a job. For most of us, it would be inauthentic to like the man in the photo, a fellow visitor to Omega Institute in Rhinebeck, New York last September. He wasn’t on staff, he wasn’t leading any workshops — he just wanted to give hugs. He was so sensitive about it, too. No one got a hug who didn’t want one. He just wore this sign while he was there, and hugged whoever responded. They were good hugs, too. Oh, yes, I took advantage of this opportunity to connect. He made me happier. He made lots of people happier. That is my aspiration, too — I want to make lots of people happier. It’s a choice we all can make, each of us in our own style. Good common sense. Good karma sense. Just plain good. I am a big fan of Annie Leonard and her colleagues at Free Range Studios. Their 2007 video, “The Story of Stuff,” dramatically shifted my attitude away from consumerism and a growth economy. Thanks to this zippy, powerful 20 minute video, I create most of my art now with recycled materials; I find replacement wine glasses from used stuff stores (since my household seems to be in contention for the wine-glass-breaking record); and even most of what I buy for the precious grand baby comes from consignment stores. Watching “The Story of Stuff” was transformational. That video is also one of the reasons I am on the happiness path, which offers an appealing alternative to the hedonic treadmill and the environmental and cultural devastation wrought by our stuff addiction. Research shows that happier people buy less stuff — which makes sense, because happy people are busy experiencing life, being kind, exercising, meditating, taking care of others, etc. Leonard’s 2007 video helped convince me of the urgency for massive cultural change away from the Gross National Product (GNP) paradigm and toward a Gross National Happiness (GNH) paradigm — a shift that needs to happen at every level, within us as individuals on up through international systems. Now she and her crew have a new video that is almost as powerful: “The Story of Solutions,” which describes both the current paradigm and the much needed paradigm shift in far more understandable language. “More” drives our lives as cogs in a growth economy. “Better” is the goal for sustainable solutions and happier humans. So simple, so elegant, so spot on. 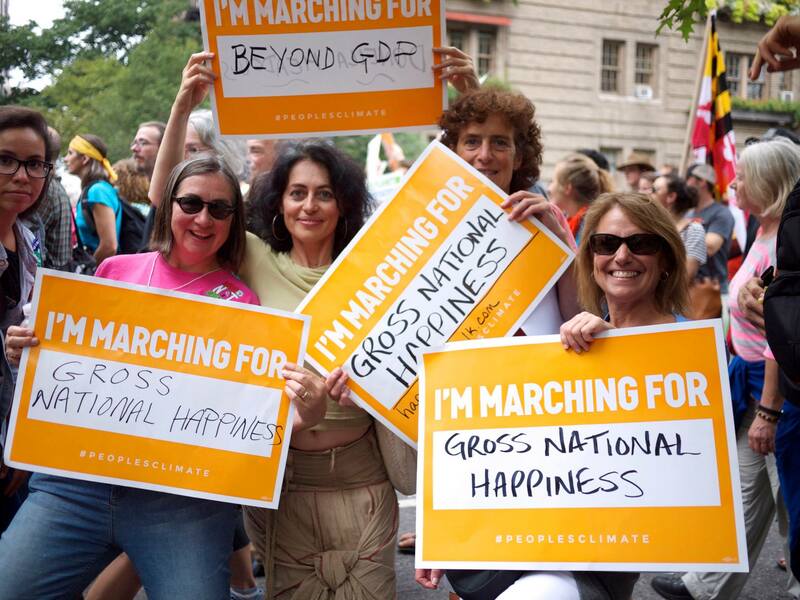 Though the phrase “Gross National Happiness” resonates with me, it has not been universally embraced. In contrast, who can argue with the clean, clear, bottom line: “better”? My work is mostly focused on helping individuals make a happiness paradigm shift at a personal level, beginning with myself, of course. I often ponder the choices my husband and I make in the context of climate change and happiness writ large and small. This helps me understand ways I need to grow toward sustainable happiness, and ways to share these options with others. 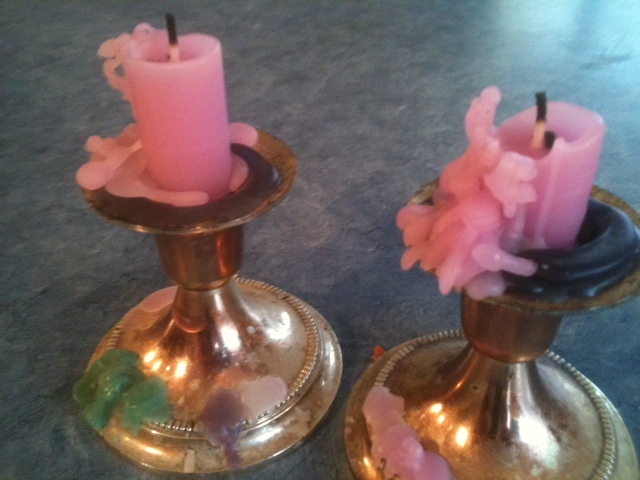 Our well used dinner candles in the morning light. Last night was no exception. I was thinking of “The Story of Solutions” because we had a “better” not “more” kind of evening. My husband and I were enjoying the pea soup he had cooked while I was in town co-leading a “How of Happiness” study group. Is there a food more humble than pea soup? We also had locally-baked bread to dip in garlic oil (the garlic came from our backyard) and a salad. It’s gotten cold here, so the wood stove in the kitchen was blazing. For many, many years we’ve eaten dinner by candlelight — always sharing a toast with a glass of wine (white for him, red for me). That’s what we did last night, too, but there was nothing fancy about the entire scenario — just a humble meal for a long-time married couple. I happen to love pea soup, but the point is, choosing better over more is not a sacrifice. 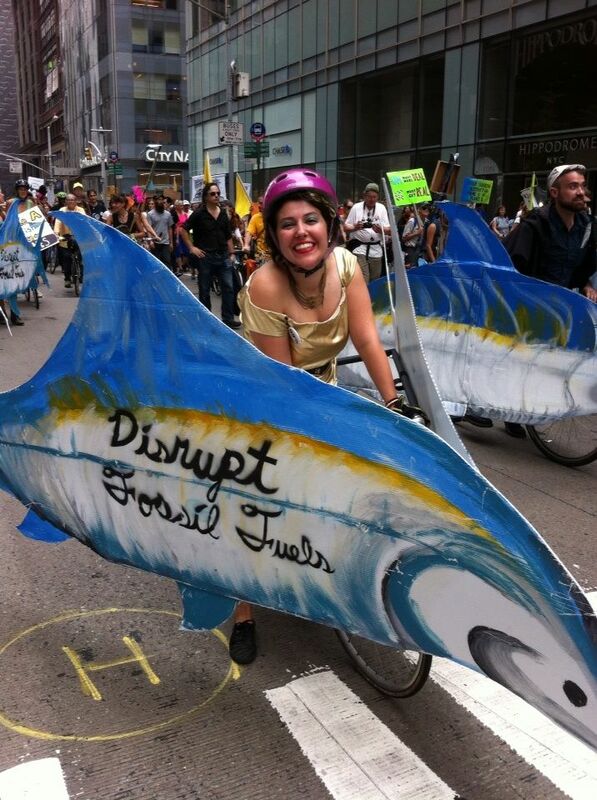 It is a happy way forward, for ourselves and our planet. It’s a solution we can live with. Happy with a purpose: pushing the stroller! I’ll admit to being just a wee bit clever with the headline. That is, I’m mushing together two different happiness threads. First, I want to share some current thoughts on why cultivating individual and systemic well-being is so vital. Second, I’ve had some personal experiences and observations on Sonja Lyubomirsky‘s “Happiness Activity No. 10” — committing to your goals, or, having a purpose. There are, of course, a multitude of reasons why happiness matters, including sounder health, greater creativity, increased compassion, more personal success,and better parenting. Perhaps because I’ve had a grand baby living in my house, I often think of Christine Carter’s book Raising Happiness and her emphasis on parents “putting on your own (happiness) oxygen masks first” to raise compassionate, joyful children. Obviously, I want to do my part to help my grand daughter become a compassionate and joyful person. Then there’s Aristotle’s quote: “Happiness is the meaning and purpose of life, the whole aim and end of human existence.” That is, all our other purposes in life are really in the service of happiness for ourselves and others. Happiness is purpose in capital letters. A few days later, the urgency of cultivating both personal happiness and a societal Gross National Happiness paradigm struck me as I listened to a National Public Radio story on how warmer temperatures that come with climate change could lead to spikes in violence and fighting. We have to figure out a better way to cope, and soon. Here’s a goal: for the impossibly big stuff (climate change) and the smaller griefs (like the one I share below), let’s substantially build our happiness reserves. Perhaps, happiness will once again be a key determinant of human survival. Unlike our ancient ancestors, we can benefit from researchers like Lyubomirsky and their guide books for our individual happiness journeys. In The How of Happiness, Lyubomirsky details 12 happiness activities; number 10 focuses on goals. My inspiration on this topic was closer to home, and very 21st century — a walk several weeks ago with my 15 month-old granddaughter Madeleine. She and I were returning from the neighborhood labyrinth about a mile and a half away. 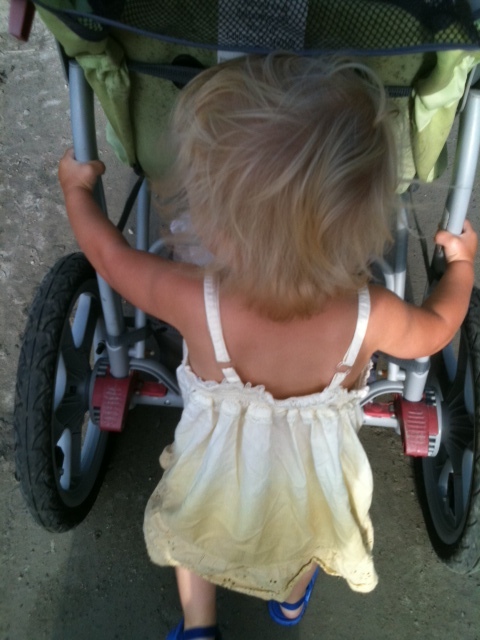 Though she contently rode to the labyrinth in her stroller, on the way back, she started fussing. For some reason, I asked her if she wanted to help push. Boy, did she. It was hot and we had a long way to go, but that little girl was determined to “push” the stroller all the way home (with grandma’s help, of course). Because I knew she was exhausted, I tried repeatedly to convince her to quit pushing and relax in the passenger seat. No way. She had a purpose, one that clearly fed her happiness in that moment. Though she is too young to articulate goals, if she could, I’m sure she would have said her goal was to push the stroller to our front door. In fact, she diligently and doggedly pushed for more than a mile. Looking down at her little body working so hard was a poignant sight — and a lesson in the value of purpose. Lyubomirsky cautions that no happiness strategy will resonate with everyone, and that is true even within my immediate nuclear family. Unlike Madeleine, her grandfather (my husband Bob) is not goal oriented. He always has many projects going — he’s just not in a hurry to finish anything. Earlier in our marriage, Bob’s lack of purpose upset me. I’d press him to articulate his goals, and he would panic because … he basically doesn’t have any. Yet, he’s content and happy. Part of my lifelong learning was to recognize that he is who he is, and one of my goals should definitely not be to change him. Similarly, Madeleine has always been a determined and focused little being; I wouldn’t even dream of trying to change her! As for me, purpose not only helps define my most satisfying days, it is also a reliable coping strategy* when life isn’t working the way I’d like — for example, dealing with the smaller grief I mentioned above. Just a few days ago, my beautiful daughter and granddaughter — who came to live with us when the baby was only five weeks old — moved to a distant state. The move is a good thing, and definitely meets my daughter’s need to have a purpose (teaching university students). I’m happy for them. Nonetheless, I was very, very sad when the moving van drove away. Everywhere I looked, I saw memories of Madeleine and our precious year and a half together. Fortunately, I also saw projects everywhere. I cried awhile, and then tackled my oppressively messy clothes situation. Two days later, I had one bag of clothes to donate to an artist friend who will re-purpose the material beautifully; two large trash bags filled with clothes to donate to the Goodwill; one trash bag filled with items that just needed to be thrown away; and a much, much neater closet and dresser. Best of all, I felt better. This project helped me say goodbye to the past and turn toward the fun times my granddaughter and I will share in the future. It was soothing, and settling. Since June, I have co-facilitated a happiness study group designed to help each participant determine which which strategies from The How of Happiness will best make each of us happy. It’s been clear to me for some time that spreading happiness is one of the most fundamentally important purposes of my life. Now, I also appreciate just how much having a purpose and pursuing my goals deepens my own happiness. It is comforting knowledge. * Developing coping strategies for challenging times is another of Lyubomirsky’s recommended happiness activities. Though I am “pumping iron” these days as part of a local bone builders class, and exercise is hugely important for happiness, today I’m using that term metaphorically. The focus of this blog is actually internal, on our innate and unique character strengths. Since it’s summer, let’s start outside, in the blueberry patch. Finally! 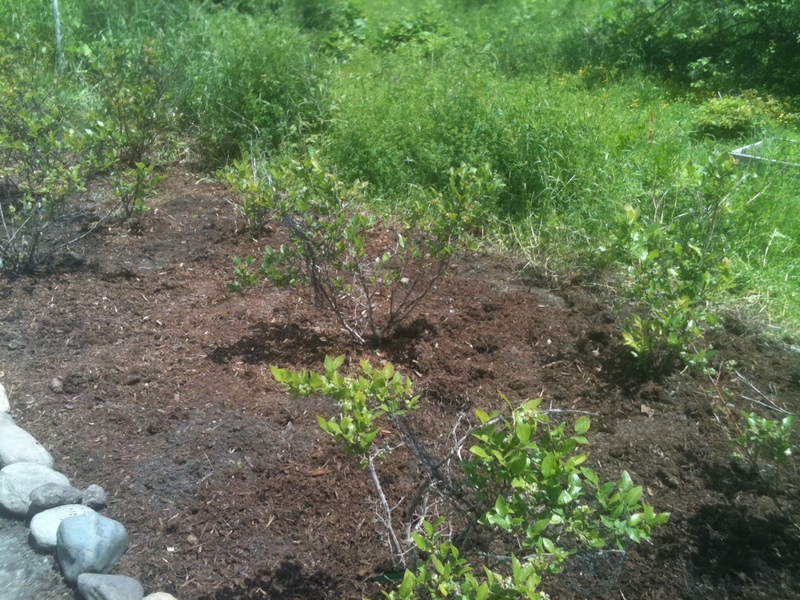 I have weeded and mulched all 17 blueberry plants! Blueberries and happiness: For two and a half years, six bags of unopened pine mulch lay undisturbed along the border of my small blueberry patch. Last summer, my daughter and her newborn with uncooperative sleep habits moved in with us, so I think I have a good excuse for never finding the time to weed and mulch the blueberries. As for summer 2011 … hmmm, I can’t quite remember what got in my way. Finally, after seeing the bags of mulch in the Google satellite image of my house (ummm, that’s embarrassing! ), I was determined to get it done this summer. By mid-June, I had finally weeded and mulched the entire patch. No more accusing mulch bags spoiling my backyard view. Now you may think that a job with such limited parameters that still took me more than two years to finish does not play to my strengths. Perhaps, but I’m still a lot better at digging in the dirt and strewing mulch than I am at storing the harvested berries. With no knowledge of how to make jams and preserves, I’ve just popped them in the freezer. Then, while weeding, I had an “aha blueberry moment”. My daughter LOVES to cook and she LOVES to research, so I made a deal with her — I’ll pick the blueberries and supply jars if she’ll figure out how to make jams and then proceed to do so. She happily said, sure! Happily because, in part, she’ll be working from her strengths (much more so than me!). Some keys to happier living make instant sense to me — like gratitude, forgiveness, kindness, savoring. Those make my heart sing. Other strategies take more time to internalize. With strengths, sometimes I’d get hints at how they work — like the time a teacher told me that she and her colleagues were unhappy because they had to spend too much time doing paperwork rather than, duh, teaching — but I had to experience it in my own life before gaining a genuine understanding. This experience, which transformed a grumpy me into a happy me, happened last winter. Let’s go back inside. The painting episode: I came to a Small Group Ministry meeting at the Montpelier Unitarian Church because I hoped discussing spiritual beliefs in an intimate setting would feed my soul. When I got there, I wished I had read the fine print. Already in low spirits (it was January and grey and I was sick with a cold that took about two months to conquer), I was quite disgruntled to learn that our group was expected to perform a service project. 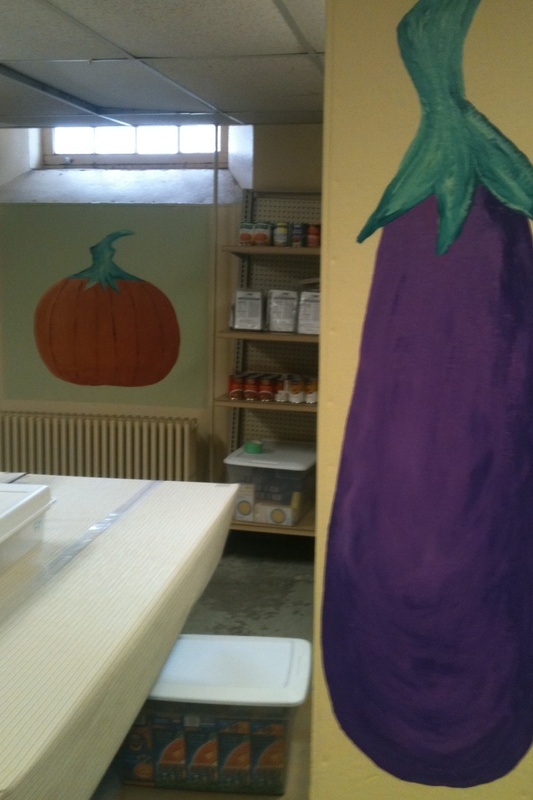 Two of the paintings our church group created at the local food shelf. “Service project!?! ?” I thought. “I didn’t sign up for any service project!” Between helping care for my live-in baby granddaughter and planning a free-to-the-public happiness weekend, I felt like my whole life was a service project already. I was displeased, and, this being a setting where we encouraged to share our genuine feelings, I said as much. Much to my surprise and pleasure, the group readily agreed. Because painting is definitely a strength of mine, suddenly, this project became joyful. 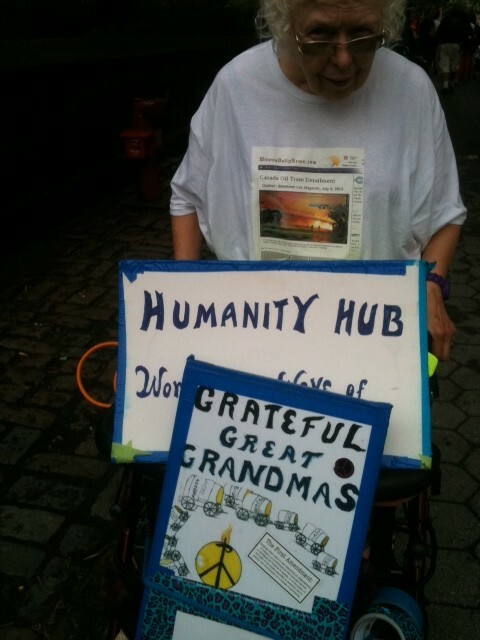 I was also grateful, because the whole group enthusiastically worked from my strength. I got to draw each fruit or veggie, then instruct the other group members on how to apply the base paints. Several of us did the shading that is so vital in making paintings come to life. In the end, we left behind paintings of a pumpkin, eggplant, cherries, grapes, a carrot, peas, and tomatoes. Other than the grapes (my fault entirely), I think we did a pretty good job. What about you? Working from our strengths is a happiness strategy Martin Seligman tested and proved with his graduate students at the University of Pennsylvania. Seligman, who is a towering, momentous figure in the positive psychology world, does a great job explaining the strengths strategy in part of this video. He and his colleagues have also given all of us all a great gift: a free VIA Survey of Character Strengths, which takes about 20 minutes to complete. I was a little surprised at my results (I expected creativity to show up higher on the list), and maybe you will be too. In any case, the next time you find yourself feeling grumpy — and we all know there will be a next time — maybe knowing your strengths will help you find your way back to happiness a little faster. Maybe even with pie, or blueberry jam! Right before the latest big blizzard, I read a post from a Texan who wrote that it was 60 degrees and sunny in his neck of the woods that day. “Why would anyone ever want to live in the northeast?” he asked. My internal response was, “Texas? Really? Are you kidding me?” Large swaths of Texas have been on fire the last few years. The state as a whole has lately suffered crushingly hot temperatures and frightening drought. Why would anyone ever want to live in Texas? When it comes to happiness, I suspect our differences emanate from a soul level. Certainly each of us needs to chart our own distinct happiness paths. As Sonja Lyubomirksy observes, “there is no one magic strategy that will help every person become happier. All of us have unique needs, interests, values, resources, and inclinations that undoubtedly predispose us to put effort into and benefit from some strategies more than others” (The How of Happiness, p.69). Or, in more folksy terms, what’s good for the goose is not necessarily good for the gander. Or is it? The Gander. That would be my husband, Bob. 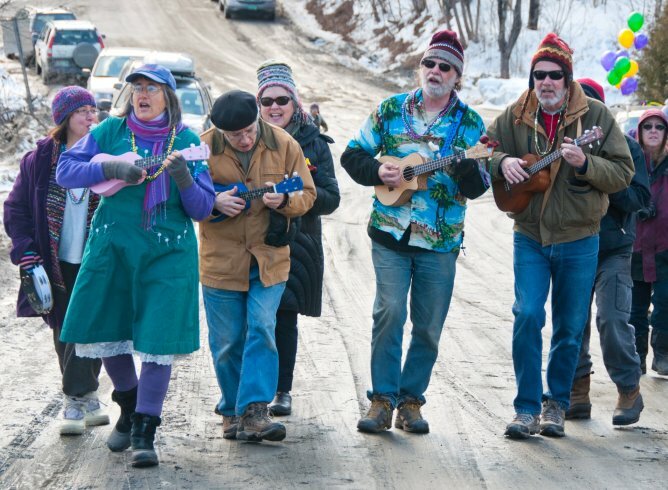 This coming Saturday afternoon, he will undoubtedly get a huge happiness boost by once again leading his merry band of ukulele players in the Maple Corner Mardi Gras parade. I’m guessing that getting into the flow of mastering the ukulele is partly why this experience gives him joy. Also, I know he appreciates this opportunity to contribute to our community’s vitality. Because performing makes his uke brothers and sisters happy too, by organizing this event, Bob further benefits by giving them this gig. Plus, of course, it is just plain fun and not really something that needs to be analyzed. 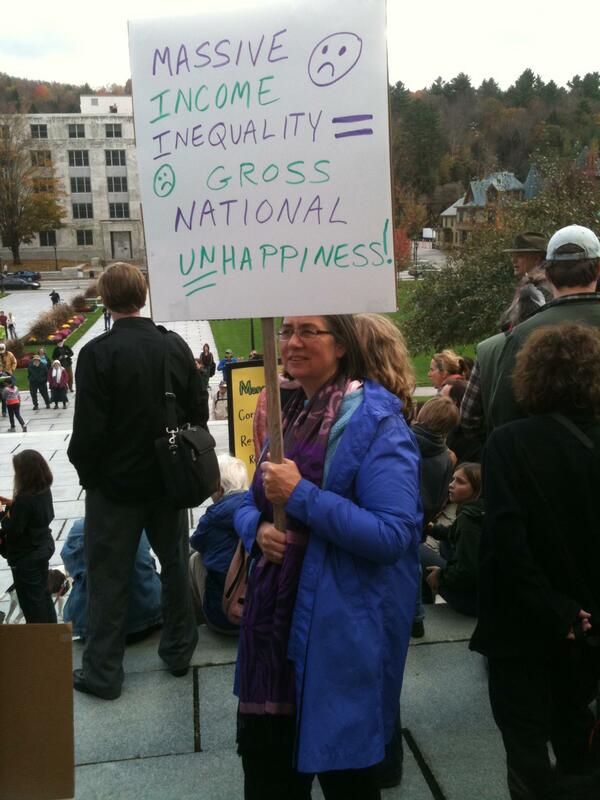 That’s me at the Vermont statehouse for a 2011 Occupy protest. These differences between my husband and me play out most Sunday mornings. While I head off to sing in the church choir and get a weekly booster shot of support in leading a good life, Bob heads for his ping pong club and several hours of very vigorous exercise with his buddies. His table tennis time is just as sacred to him as my church attendance is to me. 1. ‘The pleasant life’ is realized if we learn to savor and appreciate such basic pleasures as companionship, the natural environment and our bodily needs. 2. We can remain pleasantly stuck at this stage or we can go on to experience ‘the good life,”’ which is achieved by discovering our unique virtues and strengths and employing them creatively to enhance our lives. Writing this blog, and looking at my husband’s and my choice of activities through the lens of Seligman’s three levels of happiness, I now see that what’s good for the gander can indeed be good for the goose — just not in the way I’ve interpreted this cliche before. I always thought it meant the goose and the gander should be doing and liking the same things. Now, I see that by doing and liking different things, the goose and the gander can help each other expand and enrich their levels of happiness. Nearly everything I’ve read about what makes people happy stresses the importance of relationships, and good connections with others. Perhaps one reason this is so is because other people inevitably provide us with more varied happiness opportunities. We help each other cultivate different dimensions of happiness. I definitely need to nurture “the pleasant life” more. Bob helps me be more playful, and that is definitely a good thing. So … hand me a kazoo. And see you at the rally.